After I posted my entry about being a ‘tie snob’ on 4 August, I received an e-mail from a friend of mine, suggesting that I might like a blog about good, classic dressing, ‘A Suitable Wardrobe’. I had a look and I was immediately hooked. ‘A Suitable Wardrobe’ by Will Boehlke, who is based in San Francisco, is a great site if you are interested in style and have questions about how to ‘dress up’ or ‘dress down’ in a stylish way. Reading a little entry here and a little entry there the other day, I suddenly found two entries that were related to rowing. 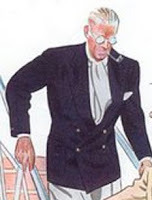 On 9 June, Mr. Boehlke posted Henley Royal, and on 19 June Trinity Boat Club Attire which both are entertaining rowing oddities. 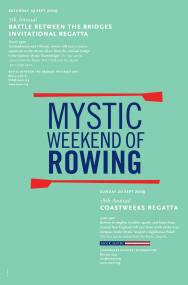 The month of September is soon upon us, which means that it is time for the Mystic Weekend of Rowing (MWOR) again. As usual it is a two-day event on the Mystic River in Mystic, Connecticut, with The Battle Between the Bridges on Saturday 19 September and the Coastweeks Regatta on Sunday 20 September. 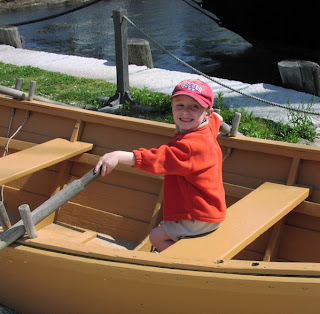 Both events have been established to promote the sport of rowing in a community environment, and they are supported by the National Rowing Foundation (NRF), Mystic Seaport Museum, and the Mystic Arts Center. In August every year there is a fundraising event, a cocktail reception for MWOR. This is always a nice evening at the Mystic Arts Center where you can mingle and rub shoulders with the organizers of the regattas and other rowing dignitaries. This year it was yesterday, and unfortunately, I was not able to attend, which was a real pity. But now to go back to the rowing events: the Saturday races between the Amtrak railroad bridge upriver to the famous historic bascule drawbridge in downtown Mystic are for invited top-notch scullers. Every year some scullers, who have competed at the World Championships and Olympic Games, find their way to Mystic to sprint on the almost 500-metre long course. These races can be best viewed from the Mystic River Park, the drawbridge, or the Mystic Art Center’s lawn. As always, Andy Card, Yale University lightweight men’s crew coach, will be the witty commentator and introduce the rowers and call their races. This is a brilliant opportunity to watch the country’s, if not the world’s, best scullers in action – and it is free!! On Sunday the rowing will move upriver to Mystic Seaport Museum for the Coastweeks Regatta, which is an event for local and regional rowers and scullers. Hundreds of athletes, men and women of all generations, will race on the 2,000-metre course from north of the I-95 overpass to the north end of Mystic Seaport. To read more about this event (and to find more information how to sign up to compete on the Sunday event), please click here. Last year, the organizers of Coastweeks Regatta had a real treat to offer the rowers, their family and friends, and the spectators at the regatta. 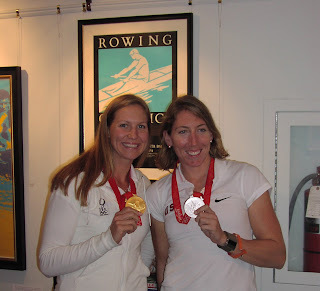 Two of the 2008 Olympic rowing medalists, Anna Cummins (gold, women’s eight; to the left) and Michelle Guerette (silver, women’s single scull; to the right), were present to give a talk on how it felt to compete at the Olympic Games and therefore be a part of the history of rowing. It was indeed a very pleasant and enjoyable event with two very humble ladies. Reading the Daily Telegraph this morning, I saw an interesting article about the actor, writer, etc. Michael Palin, one of the Monty Python fellows. He was interviewed by Marc Lee. I have always thought Palin seemed such a nice and decent chap, and, according to the article, he is. One of the reasons for the article in the Telegraph, it seems, was that two films that Palin has been involved in were released on DVD today, East of Ipswich, which he wrote for the BBC, and Three Men in a Boat from 1975 (only PAL, for now). In Three Men in a Boat - of course based on Jerome K. Jerome’s famous novel - Palin plays one of the main characters, Harris. In the Telegraph article Palin reveals that Harris resembles his own father, Edward Moreton Palin. 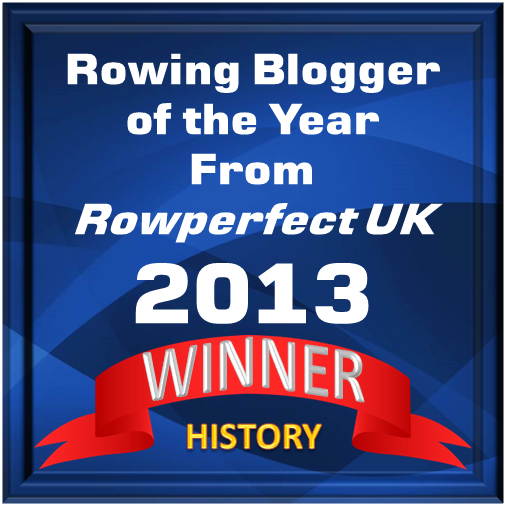 And this is the reason, this entry is posted on my rowing blog! If you would like to read the entire article in the Telegraph, please click here. 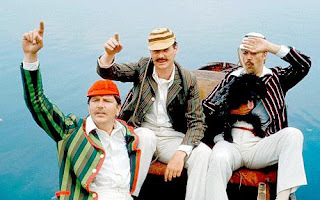 If you would like to watch Three Men in a Boat have a look at Youtube: search 'Three men in a boat, 1975'. Earlier today, when I was looking around on the web for information about some professional sculling races, I stumbled over a real gem, or maybe I should call it a treasure chest filled with rowing jewels. On the web site British Pathé – britishpathe.com – which is said to be the “world’s first digital news archive” with 3,500 hours of video and 12 million stills, you will find tons of black & white, but also colour, videos of rowing and sculling from the early 1900s to the 1970s. What you will see are ‘previews’, which means that you can not download these videos, or link them, but I guess by contacting British Pathé you can get some kind of rights to download or buy the videos. Now, if you are ready to spend hours in front of your computer screen, watching rowing, click here. Slightly more than five months ago, I started the blog “Hear The Boat Sing” (after a phrase in Steve Fairbairn’s poem “The Oarsman’s Song”). 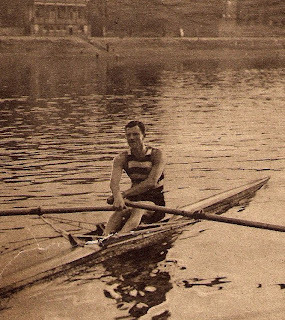 In my first entry, on 12 March, I wrote that as there are not a lot of rowing magazines around, it is hard to get anything published, especially if it is related to the history of rowing. Of course, that never stops me from trying! Some months back, I sent an article to Ms. Wendy Kewley, the editor of ARA’s fine magazine Rowing & Regatta, thinking that I should start by contacting the nicest rowing magazine there is, and then work my way down, so to say… It had worked well earlier once upon a time when I had written a couple of reviews of some rowing books. I then contacted the eminent British/American magazine Maritime Life and Traditions - nowadays sadly deceased - and the editor, Jenny Bennett, took the articles right away. Well, the result of my latest attempt arrived in the mail yesterday, when the good mail man, in his stylish pith helmet, dropped off the latest issue of Rowing & Regatta, No. 37, August / September, 2009, in my mail box. There it was, my article “Three men in a boat” about Harry Blackstaffe, William D. Kinnear, and Ernest Barry in a triple scull, or as it is also called, a treble scull. 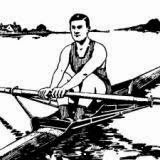 In the article, I wrote that the Olympic champions ‘Blackie’ Blackstaffe and ‘Wally’ Kinnear, and their friend, the professional champion Ernest Barry, were the most distinguished oarsmen of their time, during the 1900s and 1910s, and they were... Well, you can read it yourself in the magazine. If you are not subscribing to Rowing & Regatta, you can read more about the magazine, and maybe even subscribe to it, by clicking here. With one article published, who knows what this can be the beginning of? HAPPY BIRTHDAY – Dear Boy! Following is a list of youth fiction containing rowing as a major or minor theme. Rowing historian Bill Miller combined the majority of these titles. I have corrected some minor mistakes and added some titles to the list. However, there might still be some errors, especially when it comes to when a book was published. Some stories were published first in a magazine before making it into a published book. Please remember that many of the author names you see are pseudonyms, and that the author used his real name for some books and his pseudonym/s for others. Please feel free to contact me if you would like to add titles, but please keep in mind that this is a list for youth fiction books! Looking around on my bookshelves, I only found another “youth book” about rowing girls, The Girls of Central High on Lake Luna, or the Crew that Won (1914) by Gertrude W. Morrison. The frontispiece shows some girls in “correct” rowing dresses for girls and women at the time (image on the right). This is one in a series about the “Girls in Central High” by Morrison. 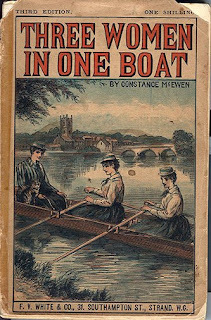 Another novel with young women is Three Women in One Boat (1891) by Constance MacEwen. The book is a parody of Jerome K. Jerome’s famous novel Three Men in a Boat (To Say Nothing of the Dog) (1889). Some time back, I had an essay posted on The Friends of Rowing History’s great web site rowinghistory.net. If you would like to read my essay, “Rowing Women as Belles des Bateaux, or To Say Nothing of the Cat”, please click here. Talking about girls rowing, I have seen book lists with titles similar to MacEwen’s, Three Girls in a Boat (n.d., but was probably published in the first half of the 1920s) by Laura A. Baker-Snow and Three Girls in a Boat (1938) by Madge and C. Fox-Smith. I have not seen copies of either book, so I am unaware if they are for girls or women. The Amalgamated Press in England published for many years weekly and bi-weekly magazines for boys and girls. Between 1922 and 1963, the company published the popular The Schoolgirls' Own Library (although during Second World War it was temporarily stopped due to paper shortage). In all 1,143 issues of The Schoolgirls’ Own Library were published. Some of the stories were written by Sheila Austin, which was a pseudonym of Stanley E. Austin (1890-1958). In the “New Series”, published after the war, in August 1956 (No. 240), Austin came out with Freda’s Rowing Ambition at Riverside. 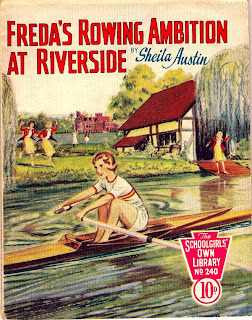 This story (64 pp) is about Freda Royston, a new girl at Riverside School and her crew – her “chums” – who manage, after various adventures, to make rowing an official sport at Riverside. Although, young women began to row at Wellesley College, Massachusetts, in mid-1870s, and Newnham College, Cambridge in England, organized a “boating society” for women in 1893, stories about rowing girls and women were rare during the first half of the 20th century. While you might think that an important milestone as the first official European rowing championships for women, held in 1954, would create an interest in publishing stories about rowing girls, it did not; nor, for that matter, were there a lot of stories published about boys’ rowing. And while there are tons of youth stories about football (soccer, that is), baseball, basket ball, and other “popular” sports, we are still waiting for stories about rowing girls and boys. Call me a snob, but I like to wear a neck tie. I guess I got it from my father, and, at least in that sense, I am a chip off the old block. I take every opportunity to wear a tie, and if there is no real reason, I wear one anyway. And to be really honest, living in America does not make it easier. Few places or occasions here demand something around your neck, unless you are going to a wedding or a funeral. Well, being interested in neck ties, I find it fascinating that some rowing clubs around the world have club ties. This is especially true in Great Britain where every rowing club with self-respect has their own tie in the colours of the club. I am sad to say this is not the case in Sweden. I tried, unsuccessfully, to introduce a club tie for my club in Malmö - actually using my old British school tie, which is in the same colours as my rowing club’s colours, black and yellow – but my idea was turned down by the club committee. In the 1990s, when I was a member for some years of the Upper Thames RC in Henley-on-Thames, England, I received the organization’s club tie as a gift. The tie is dark blue with Isis and Tamesis in white - Isis and Tamesis are sculptures on each side of the Henley Bridge. 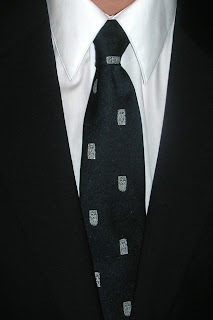 (See photo of the tie up on the left; and, if you wonder, yes it is tied with a Half-Windsor knot). During the first decades in the 20th century, many tobacco companies put a premium card with the pack of cigarettes or box of tobacco. In 1934, Churchman's Cigarette Company in England came out with a card set called “Well Known Ties”. 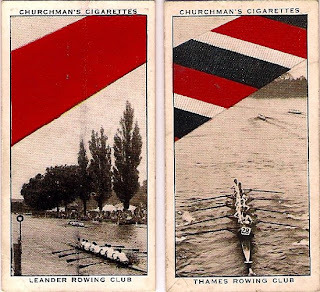 Two famous rowing clubs, and their ties, were featured on two cards, Leander Club and Thames RC. In the illustration (see top of this entry) the Leander tie looks more red than pink, or if I may correct myself, cerise. The old Putney waterman, at one time the King’s Bargemaster, ‘Bossie’ Phelps once corrected an Australian oarsman, who happened to call Leander’s colour pink: “Half a moment, Sir, let’s get this straight; it is not pink; it is cerise.” The story is printed in ‘Jumbo’ Edwards’s The Way of a Man with a Blade (1963), and I will not re-tell the whole story here as it is actually rather mean to our Aussie rowing friends. A colour combination that I personally really like is Auriol Kensington RC’s green and pink (or is that also cerise?). Anyone who is interested in the skill of tying his tie more than one way should immediately get a copy of Thomas Fink’s and Yong Mao’s The 85 Ways to Tie a Tie (2000), which will show the science and aesthetics of tie knots. A book a true gentleman, rowing chap or not, should not be without. Rowing Films - Not That Hot! Have you watched any good rowing films lately? You haven’t? Well, to be honest, I am not surprised as there are very few around. It seems the sport of rowing is hard to make convincing on the big screen. Most of the rowing films come out funny (when they are not suppose to be). One of the first films with rowing in it – and it is made to be funny – is College (1927) with Buster Keaton. Some years later, in 1934, Hollywood made a daring move with Eight Girls in a Boat (to the right), which was a remake of a German film from 1932. MGM’s first British production was A Yank at Oxford (1938) starring Robert Taylor as an American student at Oxford. 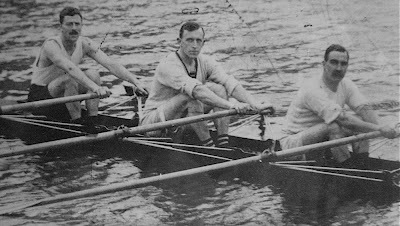 Taylor strokes his college’s eight (to the left) at bump races and at the end of the film, Oxford’s boat in the Boat Race against Cambridge. Other famous stars, or stars to be, in this film were Maureen O’Sullivan (leaving Johnny Weissmuller’s Tarzan alone in the jungle) and Vivien Leigh (before her success with Gone With The Wind). 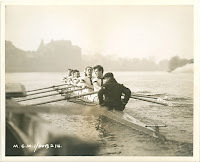 To watch Robert Taylor win the Boat Race, please go to: www.youtube.com search for A Yank at Oxford (part 9). In 1984, a terrible remake of A Yank at Oxford was done, Oxford Blues, with Rob Lowe. Please do not waste any time watching it. If you are interested in a list of documentaries on and films about rowing, please click here.